Eleventh Hour - DVD Review - BBC - Are You Screening? The American version of Eleventh Hour apparently only made it one season, though there are rumors of it getting picked up somewhere else. The Rufus Sewell led version was pretty good, and the show seemed a dream enterprise for CBS audiences, but it looks like it’s done. While the show was pretty good, and Rufus Sewell really did a nice job, it didn’t quite live up to the BBC original with Patrick Stewart. Stephen Gallagher seemed to understand the game a little better, the camerawork was quirky and unique, and Patrick Stewart is Patrick Stewart. For those who aren’t in either loop, the show is about Dr. Ian Hood (in America it’s Jacob Hood… go figure), who is a former physics professor and general genius. He works for the government now, with his special agent protector following in his wake, investigating science-related crimes. The four-episode, two-disc DVD release of the show is now available, and it’s a treat. Don’t think of the effort as a shortchange release though. There are only four episodes of the show to release, and they are very self-contained. It’s a bit more like four one-hour movies than what you might think of if there were something like a four-episode of Law & Order. The good doctor deals with a renegade trying to clone humans, a potential outbreak of smallpox, a weather researcher who is either crazy or people really are trying to silence him, and someone giving out a miracle cure for cancer. It’s a show that is at times rather intense, but for the most part saunters along through the webs of intrigue and drama in a way that only British mysteries really manage. Dr. Hood is cooly calculating, and often more interested in the science than the case. He’s also prone to the occasional rant on the issues behind the investigation. His cloning/stem-cell speech during the first episode puts you on notice that we’re dealing with someone who is perhaps working more from agenda than criminal investigation. In fact, in that episode it becomes rather hazy as to whether or not we actually have much of a crime anywhere. 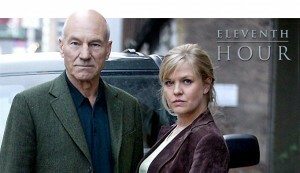 The relationship with his bodyguard (played by Ashley Jensen) is much as you’d expect really. She doesn’t love the idea, and he doesn’t either. They get along decently, but neither of them much like being forced at each other, even if they do rather like being forced at each other. You can really get a feel for the idea that series creator Stephen Gallagher wrote a couple episodes of Dr. Who, though I don’t want that to give anyone the wrong idea. Also the creator of the unfortunately short-lived Crusoe, Gallagher builds a dynamic between our two main characters that is reminiscent of the other good doctor, though it might be more like an old school, Tom Baker, Dr. Who. Though we have a more active companion in a security agent, the show has the flavor of the fantastically wise and reckless doctor tearing off into whatever he finds, and the doomed to follow tag-a-long who is filled with nerves and warnings. The DVD release is somewhat bare, but you can hardly expect much more. 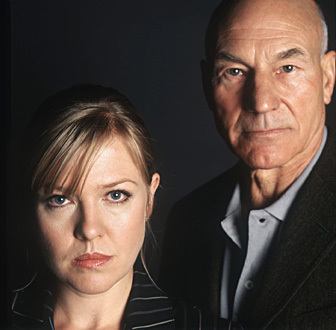 There are interviews with Patrick Stewart and Ashley Jensen, but they aren’t video. They are something like looking at a PowerPoint display of an interview transcript, but at least they’re something. You also get filmographies for the cast. There are a wide range of viewers who will find this a really interesting show. Fans of the American version should definitely skip straight to buying this, but for fans of Crusoe, Patrick Stewart, British mysteries, or just interesting television, this is definitely worth a look.